After touring the Route 66 town of Kingman, Arizona and wrapping up our visit to Grand Canyon National Park, we headed to our next spring break road trip stop: Petrified Forest National Park by way of another Route 66 town, Holbrook, Arizona. Sitting along the Little Colorado River in northeastern Arizona, Holbrook began as a town of railroaders, cattlemen, outlaws, rugged lawmen. The city was founded in 1881 or 1882, when the railroad was built and was named to honor the first chief engineer of the Atlantic And Pacific Railroad, H.R. Holbrook. For a time, Holbrook was a violent Wild West Town deemed too rough for women and churches. In fact, until 1913, it was the only county seat in the United States that didn’t have a church! By the time Route 66 was laid through town, it had become somewhat more settled, and the narrow strip of asphalt became a symbol of hope to the city and the many travelers of the Mother Road. Eventually I-40 bypassed the town in the 1960s and business declined along the Main Street. Today Holbrook is a small, welcoming town boasting several roadside attractions, historical landmarks, and vintage Route 66 Motels like the Wigwam Motel. The town is also the gateway to Petrified Forest National Park and many other northeastern Arizona attractions like the Homolovi Ruins, Window Rock, and Canyon de Chelly. The Wigwam Motel is not only a Route 66 icon, but the model for Sally’s Cozy Cone Motel, a “newly refurbished” neon-lit motel, in the Disney/Pixar movie Cars. But in Cars, the wigwams are traffic cones! We LOVE that movie and couldn’t wait to check out the Wigwam Motel in person. Jim Gray’s Petrified Wood Company is the place to go to find rocks, gems, minerals, fossils, souvenirs, Indian crafts, and of course, rainbow petrified wood. The family owned and operated rock shop sits just south of downtown Holbrook and offers visitors an unparalleled selection of natural petrified wood, polished petrified wood, and even furniture made of petrified wood. 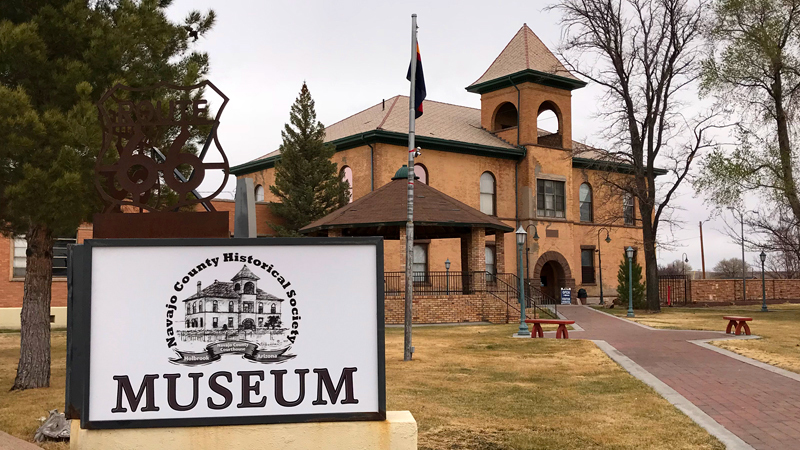 The Navajo County Historical Society Museum is free to visit and is located in the Historic Navajo County Courthouse, which was built around the original jail. There is also an awesome, big, bronze dinosaur statue on the grounds of the Navajo County Historical Society Museum with a really interesting story! The Painted Desert Indian Center is sparkling clean and bright, the staff is super friendly, they have a huge selection of gifts and souvenirs, and there are awesome dinosaurs you can get photos with and teepees kids can play in. From spectacular rainbow petrified wood and majestic panoramic vistas to ancient Puebloan ruins and petroglyphs, Petrified Forest National Park is not to be missed! Plus, seeing all of the amazing sights is easy because all of the best things to do are easily accessible off the 28 mile main road that connects the north and south entrances of the park. Holbrook, accessed by I-40 and historic Route 66, became the county seat of Navajo County, Arizona in 1895 and was incorporated in 1917. The Holbrook Visitor Center is located inside the Navajo County Courthouse and Museum at 100 E Arizona Street, Holbrook, AZ 86025. The city covers 15 square miles and sits at 5,082 feet elevation. Historic Route 66, which runs through the middle of Holbrook right down Main Street, has been designated as an All-American Road and National Scenic Byway in Arizona. Holbrook is a true Wild West town and home to several historic sites. A self-guided walking tour map is available at the visitor center and includes fascinating historical sites such as the Bucket of Blood Saloon and the Blevins House, the site of the famous shootout between Sheriff Commodore Perry Owens and the Blevins gang.